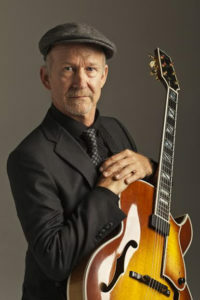 Hood Chatham is an accomplished jazz guitarist who has played in the Santa Cruz area with the Minor Thirds Jazz Trio, the Cold Porters Jazz Trio, and Jazz By Three. He his currently performing solo guitar at various Santa Cruz Mountain wineries and other local venues. He studied jazz guitar with Dale Brunig, Jimmy Bruno, and locally with Brian Fitzgerald. Major influences on his style include Jim Hall, Bill Evans, Thelonius Monk, among many others.